Nowadays, perhaps the best known War Memorial in Beeston - and the one used every year for the Act of Remembrance - stands on the bend of Middle Street, near tha Manor House and the top of Dovecote Lane. It was originally erected to the memory of the fallen of the Great War (1914-1918) and later extended in remembrance of those who died in World War2 (1939-1945). 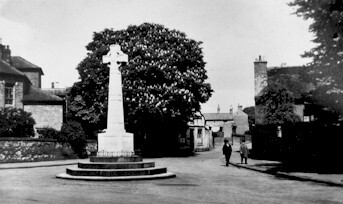 The memorial was originally erected on the site of the old village cross (see the picture in the page heading), but was moved back slightly when Middle Street was extended to Chilwell Road in the 1960s. The memorial is shown in the picture in its original, rather more gentle, surroundings.